The Washington Cider Week posts continue! 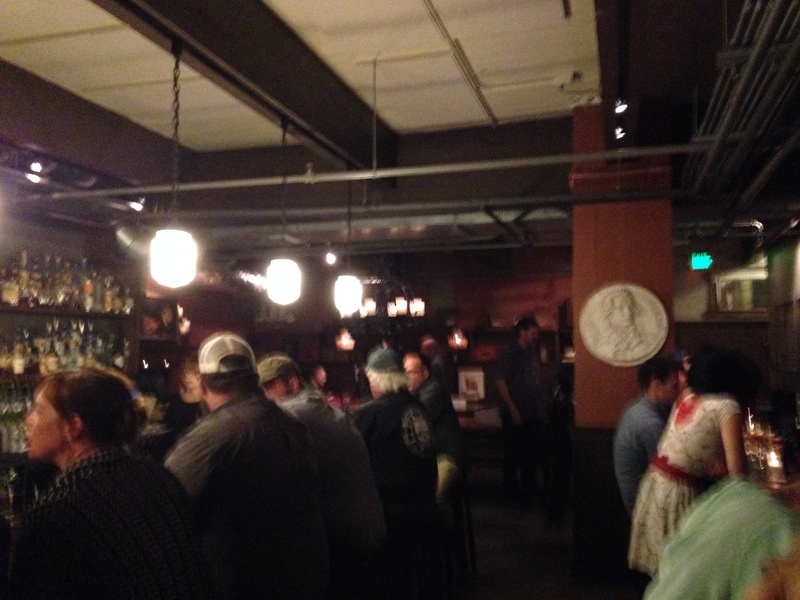 The previous week brought me to Seattle Cider and the Burgundian (Eden & Alpenfire event ) on Thursday night to kick off Washington Cider Week, and Cider Summit Seattle 2015 on Friday & Saturday (see post 1 for tasting notes and post 2 about the event & photos). This week brought me to Capitol Cider for a tasting event with Bill Bradshaw and nine Washington cideries (Tues Sept 15 2015, covered here), and to the Schilling Cider House for the 2 Towns tap night (Thurs Sept 17 2015, covered soon). I had been to Capitol Cider once before, but it was probably over a year ago. I really didn’t like that first visit much at all, as nothing really went well, from the food (it was early lunchtime on a weekend but they mostly had brunch items, not lunch), to the service (grumpy bartender), to the cider (didn’t like anything I tried, and the bartender wasn’t too forthcoming with samples; I would have preferred a flight, which they now offer). Much has changed there since then! Their service was good this time (I give them some slack as they had to give everyone a few handouts and 9 different ciders! in addition to taking any other orders). Their bottle list has much improved / expanded. However, unfortunately it is mostly just a list (they only have the smaller bottles in some fridges literally at floor level near the entry). As it is a printed list, it easily gets out of date (both times I bought bottles they only had half of what I wanted, although I was requesting more rare & special release selections). However, Capitol Cider isn’t really my sort of scene. Getting there & parking is a nightmare for one. 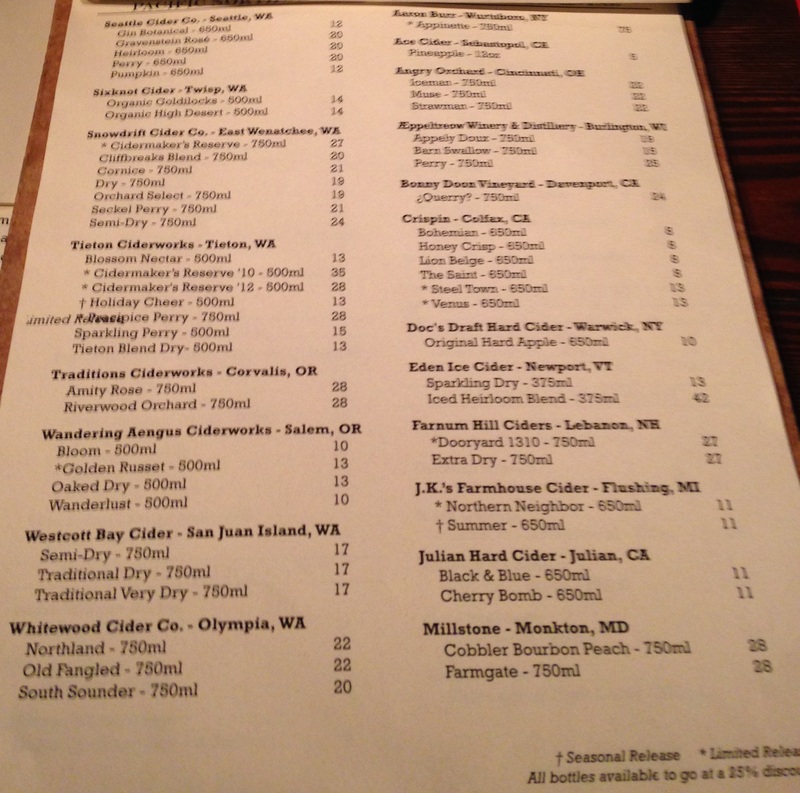 The Schilling Cider House is honestly more my style, plus they have more taps (32) and a larger bottle selection (which you can see and look at the labels). 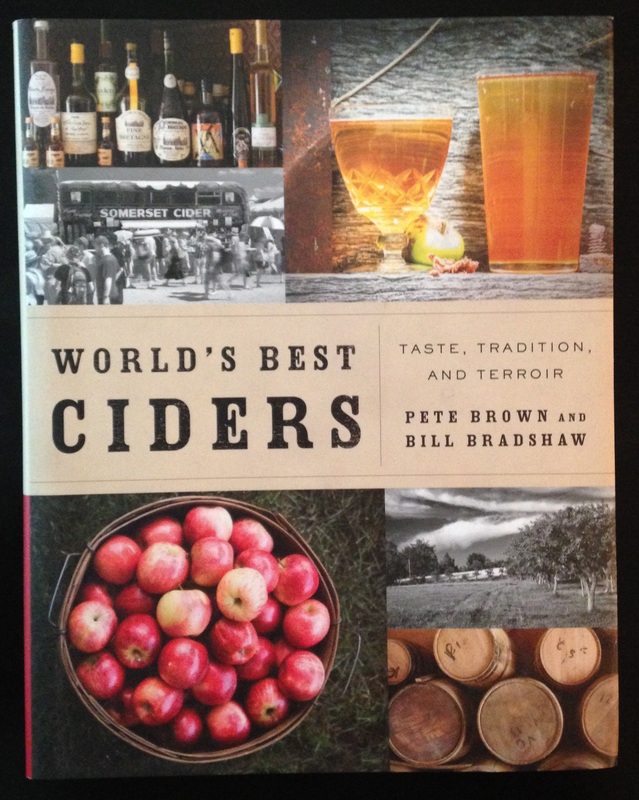 Bill Bradshaw is a cider expert who hails from the UK and has written several books about cider, among other things. 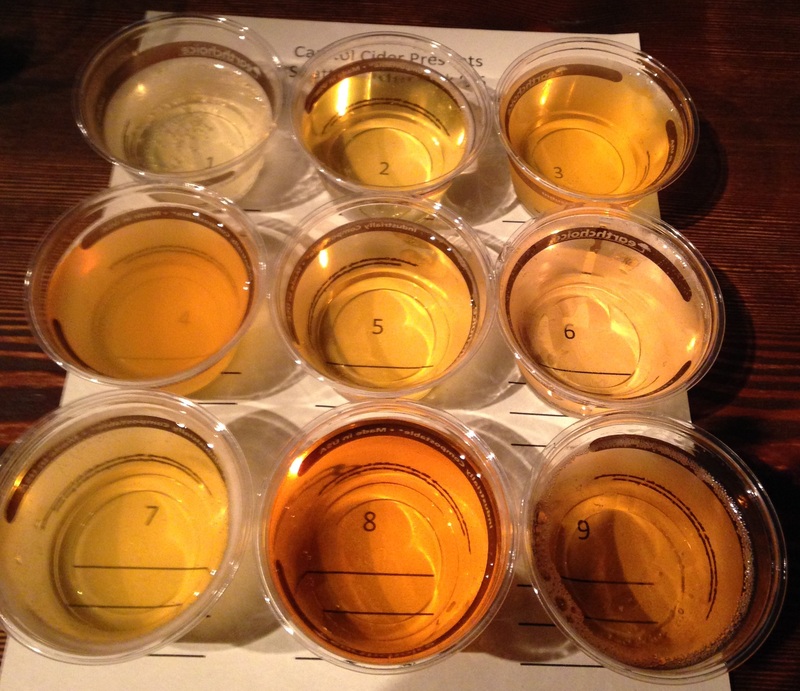 This special event was a guided tasting through ciders from nine Washington cideries. Dave White from Whitewood Cider apparently helped Bill Bradshaw choose the cideries, although I’m not sure how the ciders got chosen (it didn’t appear Bill, Dave, or the cideries themselves chose the cider selections, so it may have been availability / mostly what they already had on tap). [The cidermakers chose the ciders poured, although there was some confusion from one of the cideries as far as their selection.] They are for the most part some of the more traditional cideries in WA. 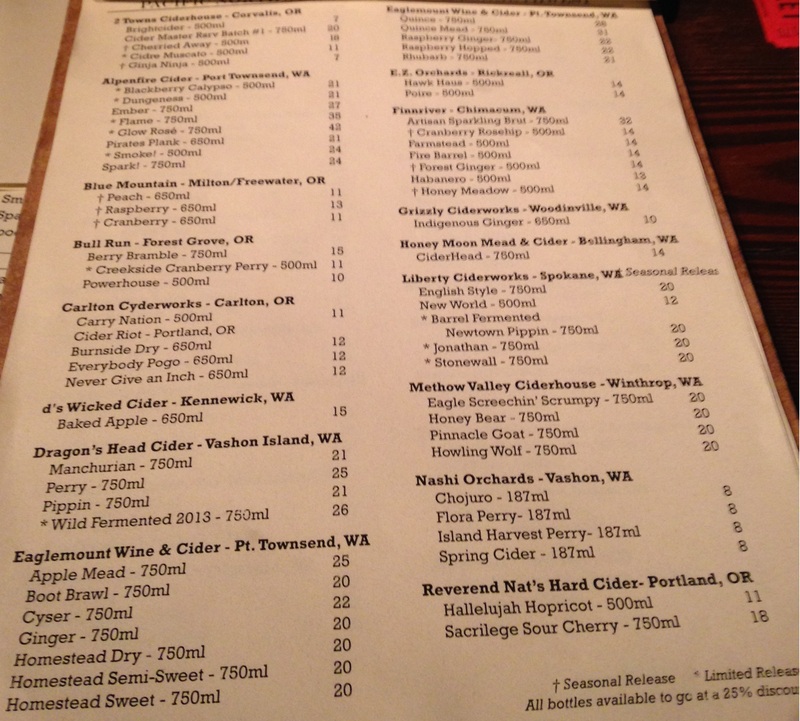 For $30, I got a flight of nine ciders (probably a 3 or 4 oz pour each), plus a full glass of the cider of my choice. I unfortunately had to drive, so I made due with my flight (finishing my favorite ciders and leaving the rest) and a couple tastes afterward, but no full glass of cider. Most of the cideries had one or more cidermakers on hand who came up on the stage and explained about their chosen cider. They were also selling Bill’s books, he was signing autographs, and many of the cideries brought some bottles which they opened after the event and poured tastes. During the event there was a slideshow of Bill’s photos. 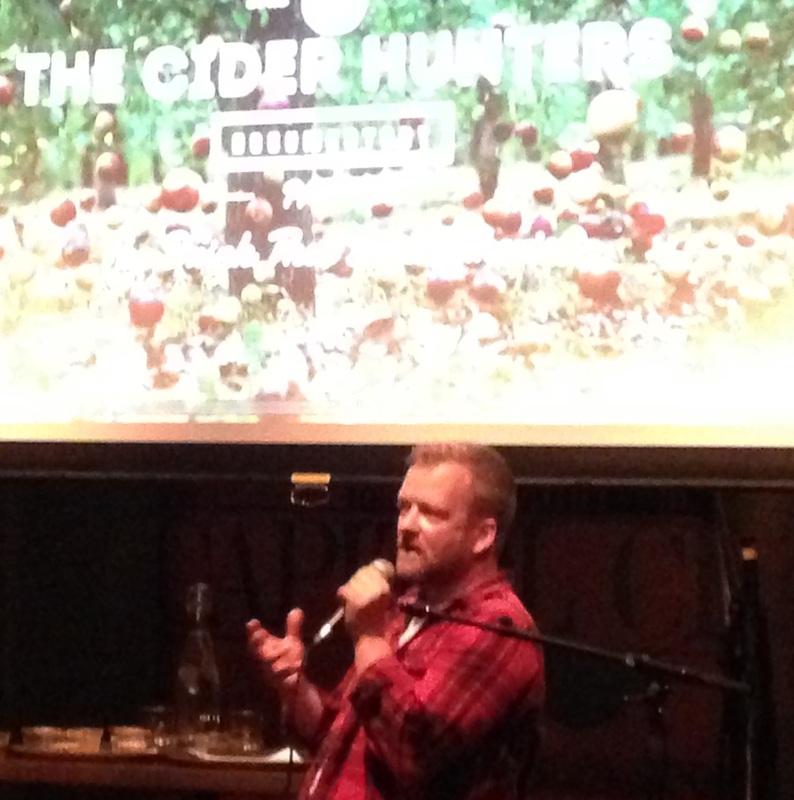 They also played the teaser for a documentary titled ‘Cider Hunters’ that he and Pete Brown (co-author of World’s Best Ciders) are fundraising for, about the history of cider in the U.S. Cider is “the drink that built America”. He described how it disappeared, breweries moved in, the craft beer movement started in the ’80s, and now we are in the age of craft cider, built from the beer explosion. Throughout the event there was some discussion on whether cider is more similar to wine or beer. It depends on who you ask. Bill seemed to lean towards beer, but I’d probably lean more towards wine as scientifically speaking cider is a type of fruit wine, although the ABV of most ciders is more similar to beer than wine. The event was also unfortunately at 6pm on a weeknight, which is late for me as I go to work at 6am. So, I didn’t get to stay too long after they were done with the guided tasting a bit after 8pm. I was surprised there were still some empty seats, as I had expected this to easily sell out (I purchased my ticket a few days in advance over the phone to ensure I wouldn’t get turned away). Considering that almost all of the 9 cideries were represented and that many brought more than one person, plus the Capitol Cider folks and such, there were almost as many folks that were working the event as attending the event! They were setting up live music and it looked like the party kept going after I left. The event was held in Capitol Cider’s basement bar area, which has a small stage, tables, bar height tables, a bar, pool tables & such, and restrooms. I had an awesome time! Many of the cidermakers I had been chatting with the previous week were there. I also hadn’t previously tried 6 out of the 9 ciders they were pouring, which is quite good odds as they are all local. I tried to take some photos, but the lighting was pretty horrible. Click to biggify. Upon sitting down I spotted a clipboard full of menus. They had menus for their cider tap list, beer & regular cocktails, cider cocktails, cider flights, food, and a cider bottle list! I focused on photographing the cider stuff. Weird angles to avoid glare; sorry. Their food menu (gluten free restaurant by the way) is on their website. I ate some pho before the event as I wasn’t sure if it would work well to try to eat dinner during it, and their menu is a bit fru-fru for my liking. That was a good call as its difficult enough to taste cider and take notes! I did however order some creme brulee, which was pretty disappointing, as it was almost half fruit, small, and expensive. Now, on to the nine ciders of the night! They were tasted in an order to try to minimize the effect the last would have on the next, not in the numerical (alphabetical) order. I believe that all the ciders which were on their tap list were tap pours, and the remaining two (Nashi and Westcott Bay) were bottle pours. I really enjoyed hearing about the ciders as I was tasting them. They also took audience questions / comments. (6) Tieton Ciderworks Sparkling Perry, 5.5% ABV. I hadn’t tried this one before, but have tried a number of varieties from Tieton. Its part of their “top shelf ciders” along with the Cidermaker’s Reserve (which I’ve reviewed), available in pretty 500ml bottles. Craig Campbell, a grower at Tieton’s orchard (and the one who started Tieton with his wife), was the presenter. It is made from 11 varieties of perry pears grown in their orchard (which is the largest cider apple & perry pear orchards in Washington, but still small by orchard standards). Craig noted that pears are much more difficult to grow and press into juice than apples. This perry was made using a French keeving technique, where it is slow fermented with wild yeast for 5 months. He said this method can calm some of the tannins of the perry pears. Craig also noted that this perry was just bottled/kegged in May, and may taste even better after bottle aging for 1-2 years. On the drier side of semi-sweet. Mild tartness, bitterness, and tannins. Medium bodied. Unique strawberry notes. I would have liked more carbonation, but I imagine my sample may have sat for a bit / not been able to be poured correctly due to the size. Pretty tasty! (5) Nashi Orchards Issho Ni “Together” Cider, 6.9% ABV. This was my first time trying anything from Nashi Orchards, although I have one of their perries at home. Jim Gerlach, owner and cidermaker, was there to present. This is one of the few (two?) ciders that Nashi Orchards makes; they specialize in perry. Their orchard is full of asian pear varieties and they pride themselves in using traditional cidermaking methods. This cider was made using apples from the Vashon Island community, which included a lot of crabapples and heirloom apple varieties. It was dry fermented and not backsweetened. Smells like English cider, of rich bittersweet apples. On the drier side of semi-dry. Moderate to high tannins and bitterness. Mild tartness. I liked the bark better than the bite on this one (smelled better than it tasted). It was a bit too high in tannins & bitterness for my liking, likely from the high crabapple content. I imagine like most ciders, if I was having a full glass, I would have liked it better (vs. having a tasting glass). (7) Snowdrift Dry, 7.6% ABV. I’ve tried a number of Snowdrift cider varieties; my favorites so far are Red (made from red fleshed apples) and Cornice (barrel aged). This one was presented by someone from Capitol Cider, but Snowdrift sent along some notes. It was commented that they have a small orchard and cidery which is ideally located in East Wenatchee, with its hot summers and cold winters, ideal for cider apples which thrive with temperature variations. Their orchard is mostly Yarlington Mill cider apples, but they have over 40 apple varieties. They noted this cider won an international contest, which is rare for a PNW cider (vs. a UK cider). Semi-dry. Clean plain apple scent. Low in tannins, bitterness, acidity, and tartness. Some citrus notes, but I otherwise didn’t pick up much. Smooth. The alcohol is well hidden. I found it kinda boring, but a very solid selection. (2) Dragon’s Head Traditional, 6.9% ABV. This is the variety I tried at Cider Summit. I also have a bottle of their Wild Fermented at home. Wes Cherry (co-owner with his wife) presented. They are from Vashon Island, where they grow over 70 varieties of cider apples, mostly English and some French. They moved their cidery from the Seattle area 5 years ago to start the orchard. This year was their first significant harvest from their own orchard. This cider underwent malolactic fermentation (which is when malic acid is converted to lactic acid, and can often be considered a fault but some cidermakers desire it) which was arrested to retain some residual sweetness and give some butterscotch notes. Semi-dry. Higher acidity. Citrus and fruity notes. Low to moderate tannins and bitterness. Mild tartness. I really enjoyed this cider. Probably as it had a little more complexity to it and didn’t go too overboard on tannins and bitterness. (8) Westcott Bay Semi-Dry, 6.8% ABV. This was my first time trying any ciders from Westcott Bay. Presented by Capitol Cider. Westcott Bay has their own cider orchard in the San Juan Islands which dates back to the 1870s. They re-planted in the mid 1990s and released their first cider in 1999. They make more traditional apples using cider apple varieties such as Kingston Black, Yarlington Mill, Dabinett and Sweet Coppin. Semi-sweet. Similar to English cider. Bitter finish, but still only mild to moderate. Moderate tannins. Bolder flavor. I really enjoyed this cider. I like ciders like this which have a bold flavor profile without being too bitter or too high in tannins. (1) Alpenfire Simple Cider, 6.9% ABV. I’ve had a number of ciders from Alpenfire, but hadn’t even heard of this one (it looks like it may be tap only at this time?). I particularly like their Apocalypso and Spark! ciders. Presented by Nancy Bishop. They described themselves as a more traditional cidery whose ciders tend to be higher in tannins. They planted their cider apple orchard in 2003, then needed to learn how to use it, and get people to buy their ciders! This variety is their least traditional cider, made from basic heirloom and dessert apples. It is sweeter and described as having some honeysuckle aromas, and was lightly oak aged. On the sweeter side of semi-sweet. Slightly hazy. I picked up some honey, pear, and mild herbal notes. No significant tannins, bitterness, acidity, tartness, etc. I thought it was rather complex for a simple cider! I really enjoyed it. (4) Liberty Ciderworks Abbess, 7.6% ABV. I’ve had a number of ciders from Liberty. Presented by Rick Hastings. This is a newer cidery from Spokane, open about a year and a half, and they currently produce 7,500 liters a year. Unlike many of the cideries featured, they don’t have their own orchard. However, they have found ways (probably at great expense) to obtain cider apples, primarily from three different orchards, including from Garfield WA. They also use a lot of crabapples. They aim to keep the apple centric, and don’t plan to do flavored ciders; their Turncoat Dry Hop cider and this one is as flavored as they get. 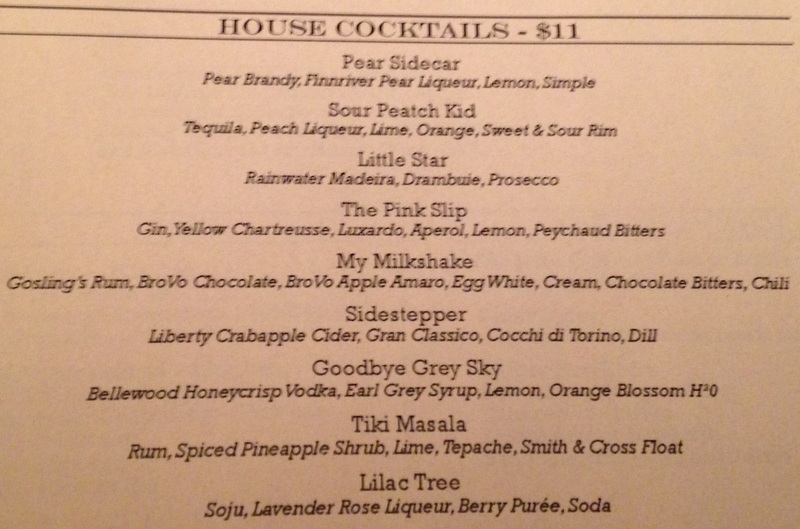 I particularly like their Manchurian Crabapple and English Style ciders. Rick commented the Spokane cider market is growing slower than Seattle, but is still growing. Liberty was tasting their new Abbess variety, with gin botanicals. Made from Empire, Macintosh, and Manchurian Crabapples. Its been out for about a month in their tap room and has been popular. English cider scent with a hint of botanicals. On the drier side of semi-dry. Bold flavored. A hint of botanical flavor. Significant tartness, bitterness, and tannins. I’m not a huge fan of this one, but it didn’t have any faults and is a solid selection. (9) Whitewood Cider Kingston Black, 9.7 ABV. I had tried this cider at Cider Summit, but didn’t mind having it again in the least, as it was one of my favorites! I’ve only tried Whitewood’s Summer Switchel and this one, but look forward to trying some others. Presented by Dave White. Whitewood released their first ciders in 2013, so this is their third season. Dave aims to make more traditional ciders, with heirloom & cider apple varieties. He noted their Southsounder cider is made from apples within 20 miles of Olympia. This Kingston Black cider was made with champagne yeast, but Dave hopes to eventually make a wild fermented batch. It is 80% Kingston Black and 20% Cornish [Porter’s] Perfection, much to Dave’s disappointment. He aimed to make a single varietal, but apparently the Kingston Black apples were sliding around too much during pressing or something, as they were sweated to bring out more flavor. Doing an almost single varietal Kingston Black cider must have been very expensive, as they are rare. He noted some Woodinville Whiskey was added to the barrel before aging. [The barrel was from Wishkah River Distillery in Aberdeen, WA.] I don’t like aged spirits, but love the flavor in a cider. This cider was taken out of fermentation in early 2014 and barrel aged until just recently. Dry. Whiskey and vanilla notes. Rich bold flavor. Very smooth, with hidden ABV. Low to moderate bitterness. Yum! (3) Finnriver Fire Barrel, 6.5% ABV. I’ve tried a large number of Finnriver ciders, and even tried this variety quite awhile ago. I remembered really looking forward to it but being disappointed. I bought another bottle recently as so many folks enjoy this cider, and I wanted to give it another chance, as my palate has changed. So, here will eventually be a full review of it here. Presented by Eric Jorgensen, a co-founder. They were described as a small organic farm which started selling cider in 2010. Eric thinks they were the least traditional of the nine cideries present. However, he described this as their most traditional cider, as it is made from cider apples. They started a second orchard three years ago and aim to remain sustainable and organic. This cider recipe was original produced by Drew Zimmerman, who sold the rights when he retired. It is made from Kingston Black, Yarlington Mill, and Dabinett cider apple varieties. This cider is no longer aged in Kentucky whiskey barrels though, as they aim to keep it more local, instead using UT or WA barrels. This cider has inspired Finnriver to take on other barrel aging projects. They mentioned they are barrel aging a small batch of their Black Currant cider, which sounds awesome, as that is one of my favorites of theirs, along with Honey Meadow. Very smooth. On the sweeter side of semi-dry. Mild barrel notes. Bold flavor. Moderate tannins, bitterness, and acidity. I was surprised with how much I enjoyed this cider, in contrast to my memory from awhile back. I look forward to drinking the bottle I have at home! I was interested in buying four bottles to take home from Capitol Cider, but they only had two of the ones I wanted, Virtue The Mitten and AeppelTreow Appely Doux. I had heard of both but didn’t know they even sold them in WA! 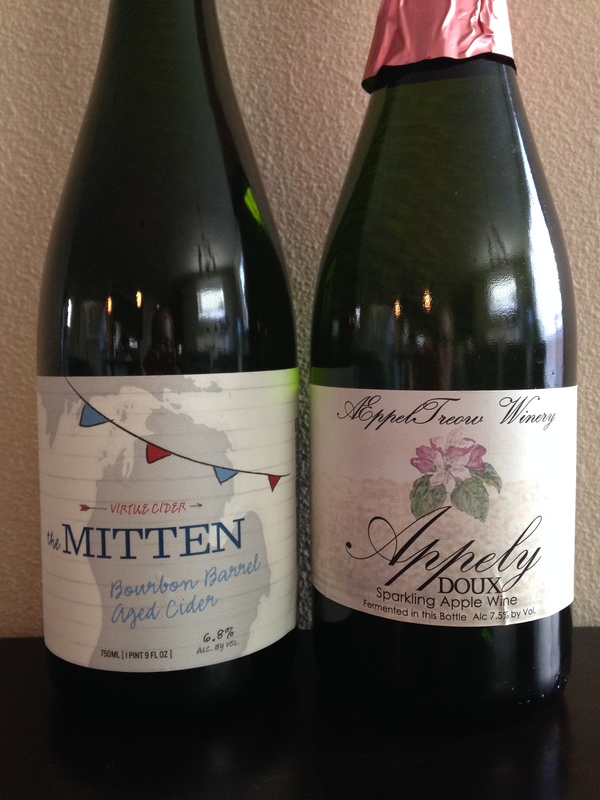 I had been wanting to try The Mitten ever since I got into cider; it often makes top cider lists. 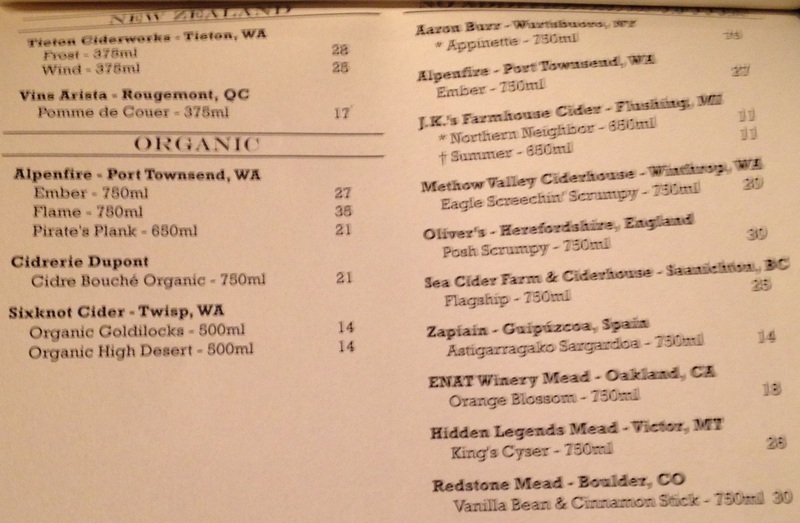 Note that the prices shown on their bottle list below are to drink there, but you get a 25% discount to take home. That brings their prices just a bit over local bottle shops for most ciders. 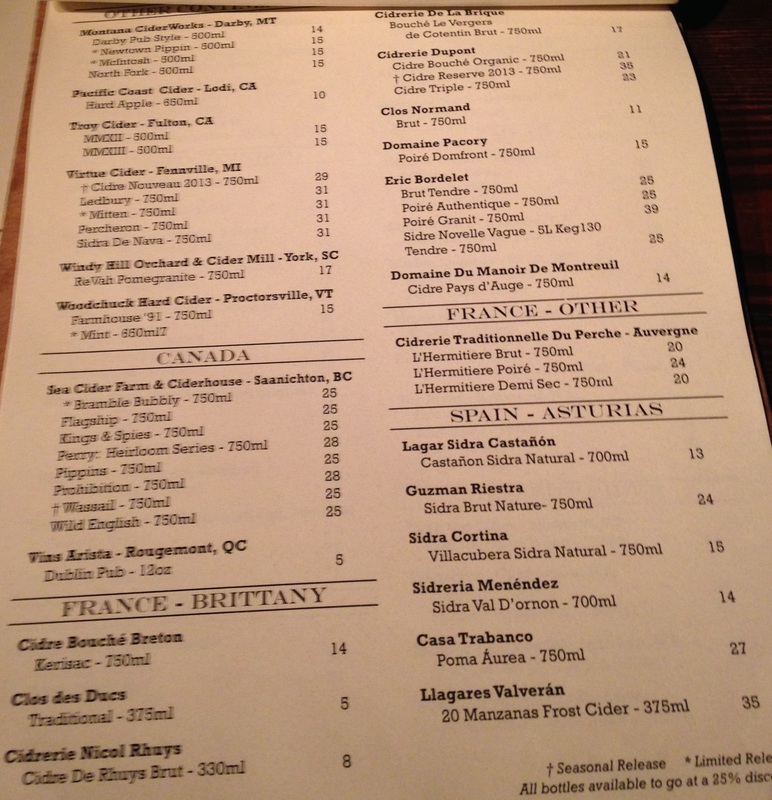 The cost to drink a bottle is much less of a markup than most wine lists. However, with all those ciders on tap, why would you want to? They initially forgot to apply the 25% discount (they were very busy and I was asked them to go to the back and find specific bottles), so I was very glad I checked my receipt. 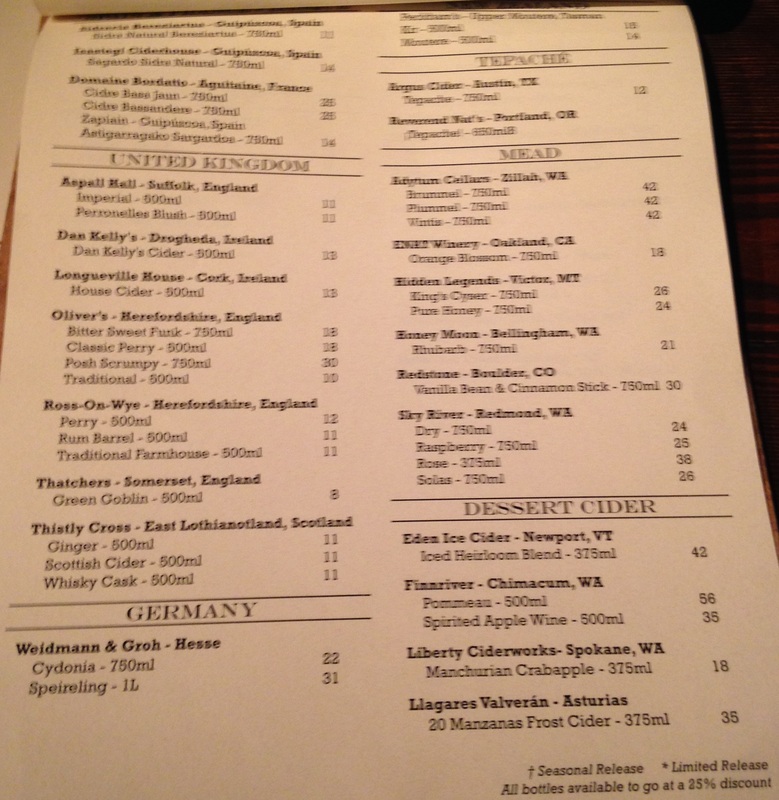 Unfortunately the cider list was stapled at the top, so even taking it off the clipboard I couldn’t get good photos. The angles are again to avoid glare from overhead lighting. Impressive bottle list! However, the win still goes to the Schilling Cider House in Fremont, as you can look at the actual bottles. 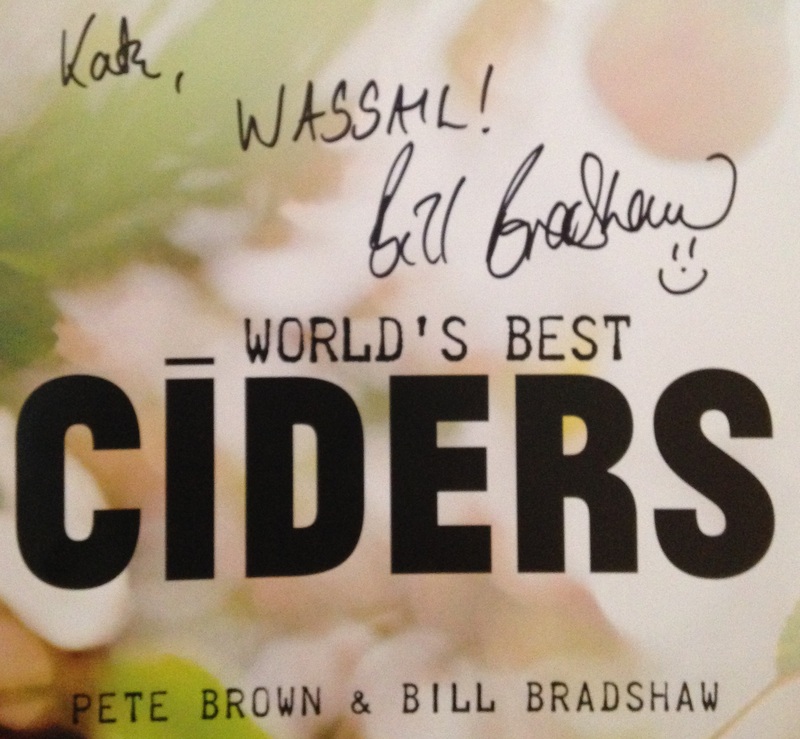 I got my new copy of World’s Best Ciders (which I reviewed here recently) autographed by Bill Bradshaw, and even got to chat with him for a few minutes. Stay tuned for the last but not least Washington Cider Week event post, from the 2 Towns night at the Schilling Cider House! Like Cider Says on Facebook for the latest info.